These cookies are extremely easy to make. The only labor intensive part is dropping so many cookies on the cookie sheet, but if you don’t need 100 cookies you can half the recipe (and the time you spend dropping globs of batter), or simply pour it all into a wide, slightly deep baking pan and then cut it into bars. 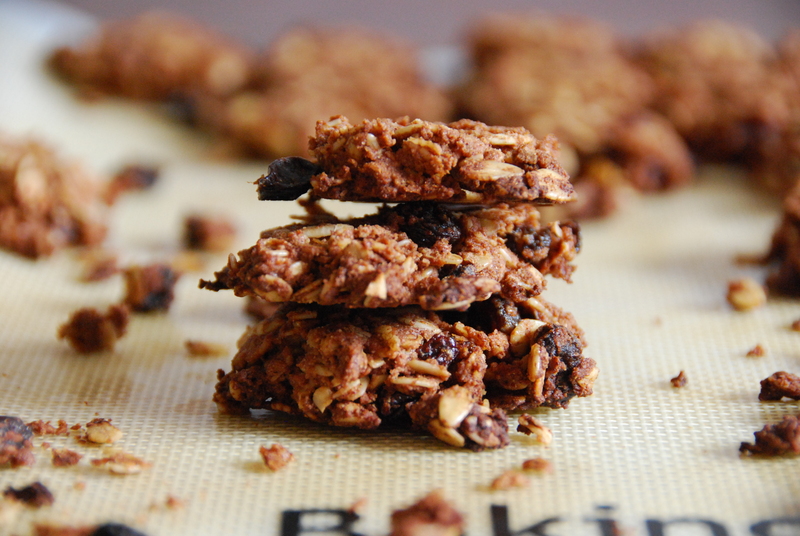 Good cookies fall into two categories in my world: chewy, or crunchy. 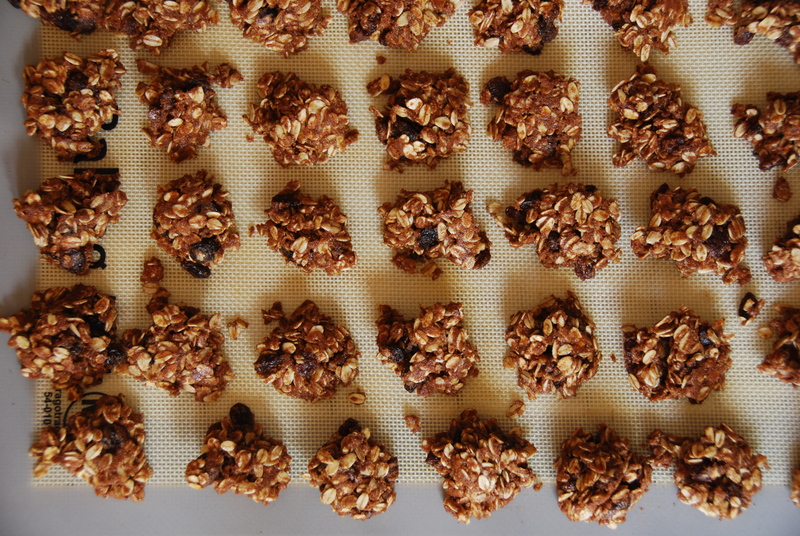 This recipe is for crunchy cookies, but if you want chewier cookies just under-bake them and then freeze. Please note that if not frozen, the cookies won’t be chewy – just soft and almost cake-like. The freezing part is crucial to adding a bit of chewiness to the texture – otherwise they are just soft, but not chewy. It also makes them perfectly portable across all seasons, so on a cold winter day you could enjoy a warm, crunchy cookie alongside your steaming cup of coffee, and on a hot summer day you can pop a few chewy, cold ones out of the freezer and enjoy. So what about you? 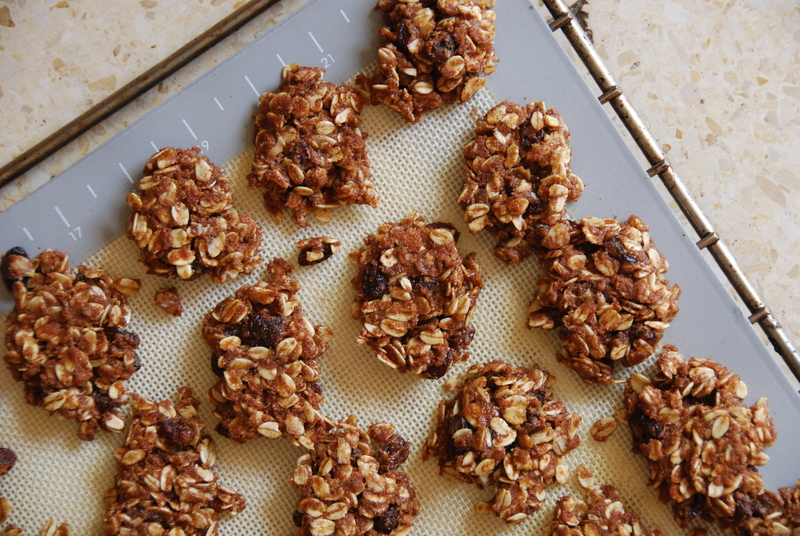 Are you a chewy-cookie or crunchy-cookie person? *Adapted from my beautiful sister-in-law’s recipe, who always makes me feel cozy. This is going to be extremely easy! Preheat your oven to 180 degrees Celsius, which are 350 degrees Fahrenheit) and line a baking sheet with parchment paper. 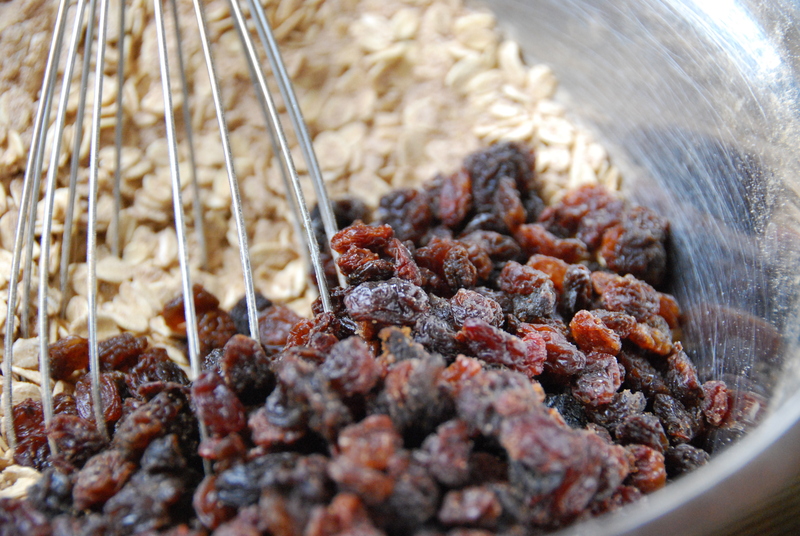 First, whisk together all the dry ingredients but the raisins until uniform. Then stir in the raisins. 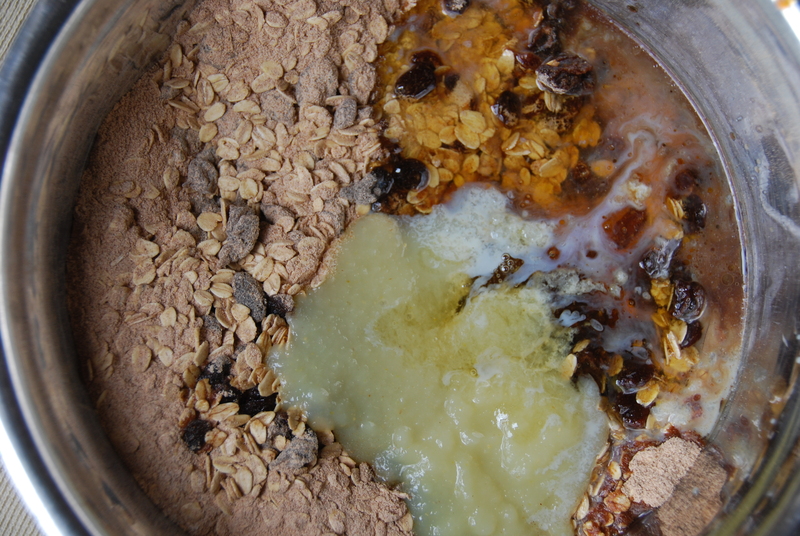 Next, add the wet ingredients and mix with a fork until completely uniform. Now take two little spoons and start dropping small globs of batter onto your baking sheet. This is actually the only somewhat labor-intensive part, because the batter tends to not really stick together [see my Lazy Girl’s solution below!]. The solution to this is to a) practice, practice, practice! and b) follow this tip: Use one of the spoons to scoop out a small glob by pressing it against the side of the bowl. This will ensure the glob is tightly packed, which will make it less likely to fall apart. Then use the back of the other spoon to slide the glob off the first spoon and onto the baking sheet. After all the globs are on your baking sheet, use the back of a fork to squash them down. You may have to gently hold them down with your fingers to keep them from coming up with the fork. They will not be completely round, but their amorphousness is part of what makes these cookies so endearing and cozy. 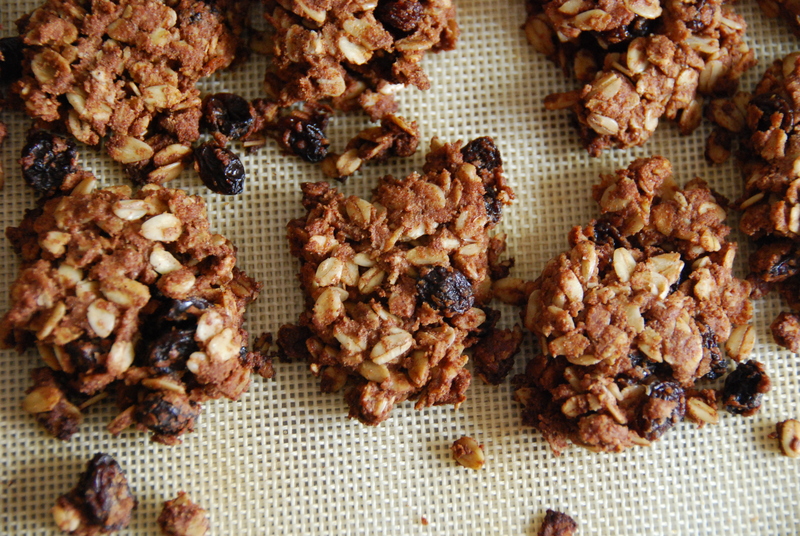 Then bake for 20 minutes or until the cookies are hard [if you prefer crunchy winter cookies], or just until they are no longer wet and then freeze them [if it is chewier, frozen summer cookies you’re after]. Either way, store cookies in an airtight box. They have not kept more than 5 days in my house, because they all got eaten (yeah, all 100 of them. Don’t judge us). Lazy Girl Solution: If you simply cannot spend so much time dropping little globs of deliciousness onto a baking sheet, either because you have better things to do or because you just want them to be ready faster, you can smooth the batter down onto a greased / lined baking sheet and just cut it into bars later. The cookies are not cookie shaped, but really, who cares? 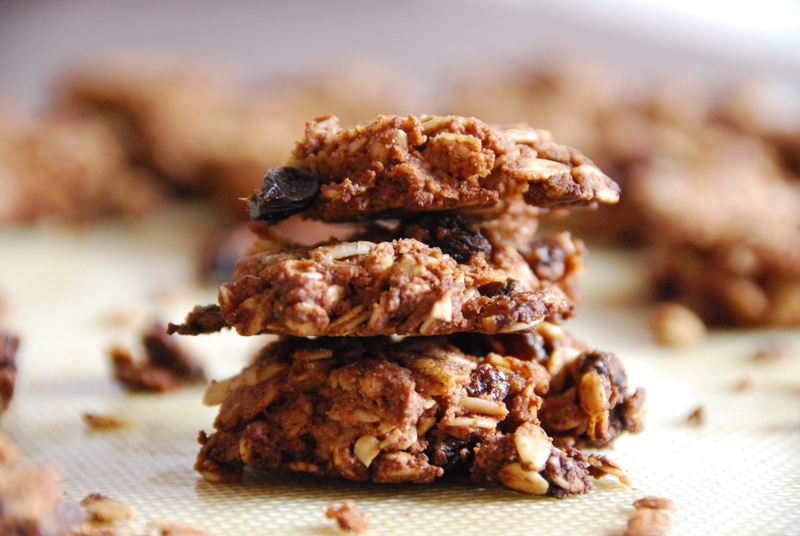 The only thing you have to watch out for is to not pack them too tightly into the pan, because these cookies do NOT work if they are not airy. 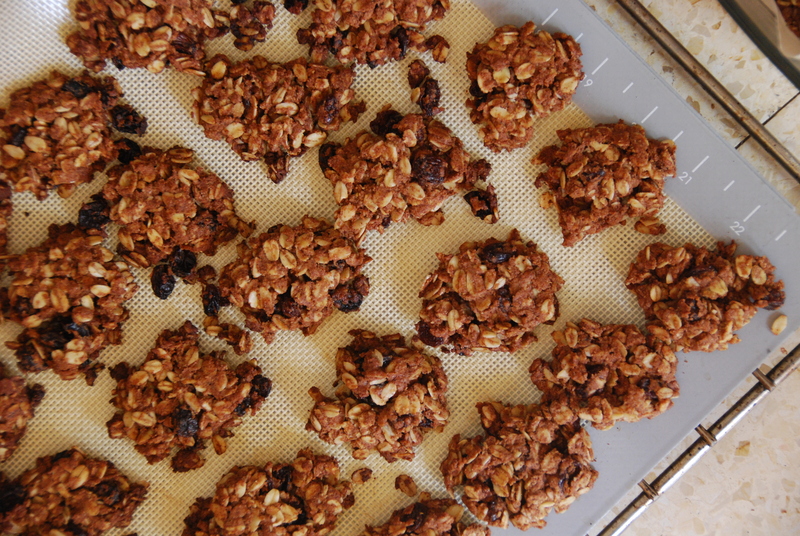 Super Girl Improvement: If you have some extra time and want these cookies to really shine, mix the oats with a bit of oil until they are all lightly coated and then bake until toasted. 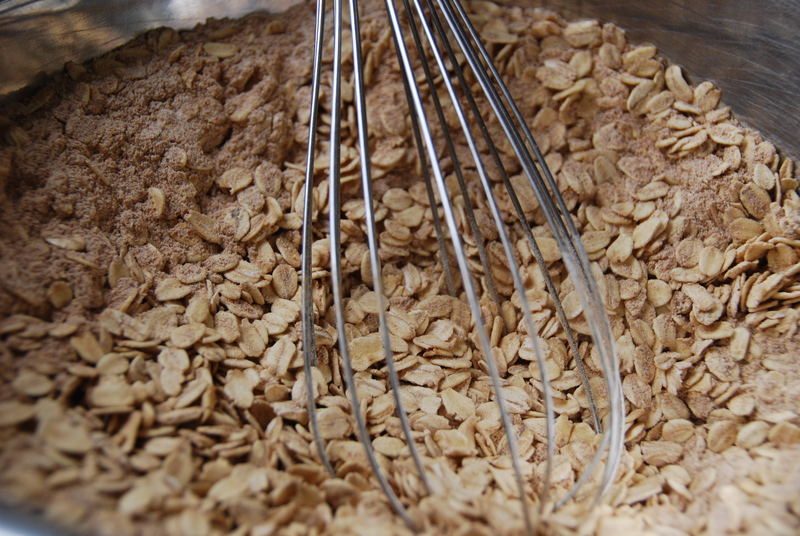 Whisk together 4 cups coarse oatmeal, 2 cups whole wheat flour, 3 Tbs. 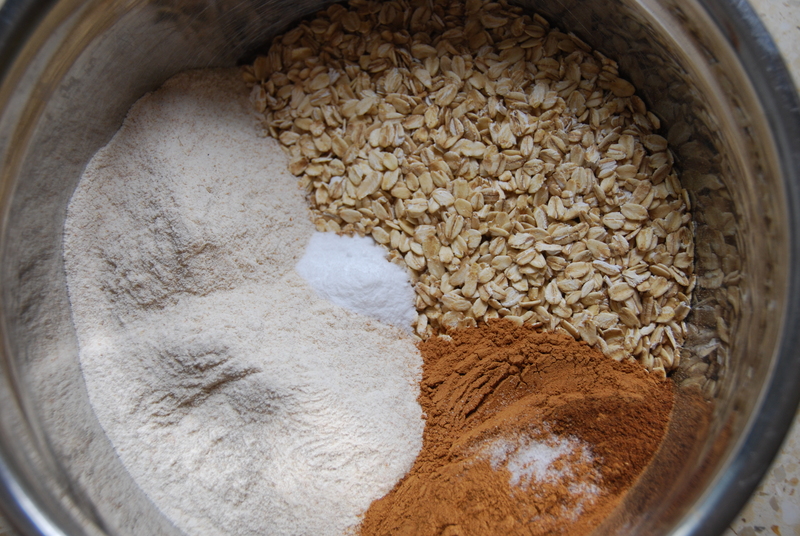 cinnamon, 1 tsp ground nutmeg, 1 tsp baking soda, and 1/2 tsp salt until uniform. 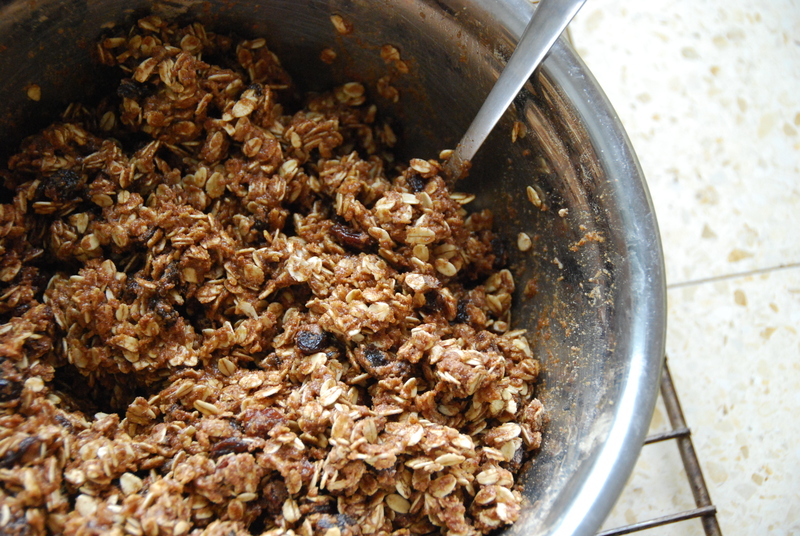 Then stir in 1.5 cups raisins. 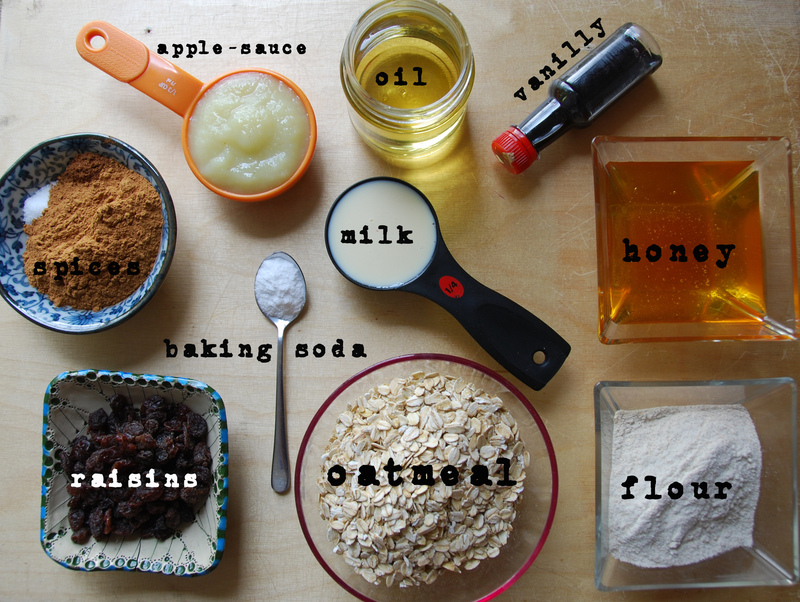 Add 3/4 cup oil, 1/4 cup milk of choice, 2/3 cup honey, 2 tsp vanilla extract and 1/3 cup applesauce and mix until uniform. 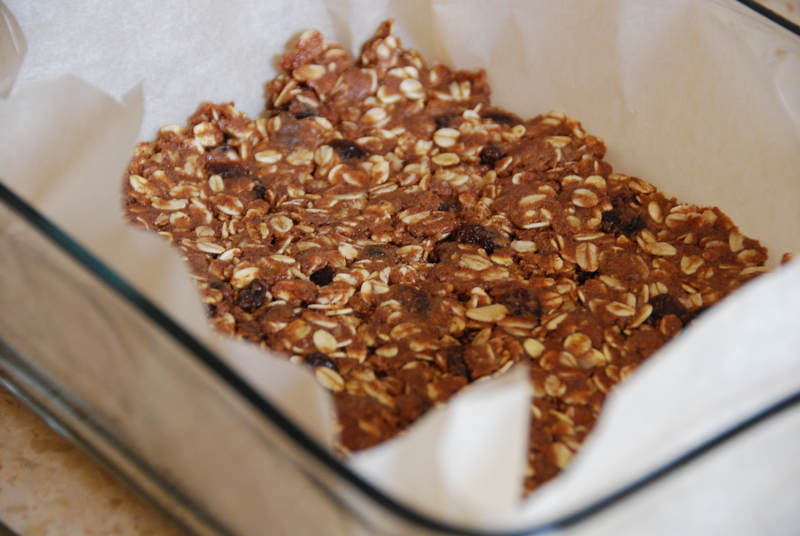 Using small spoons, drop small globs of batter on a lined baking sheet and flatten them down with the back of a fork. Bake for 15-20 minutes or until cookies no longer feel soft. 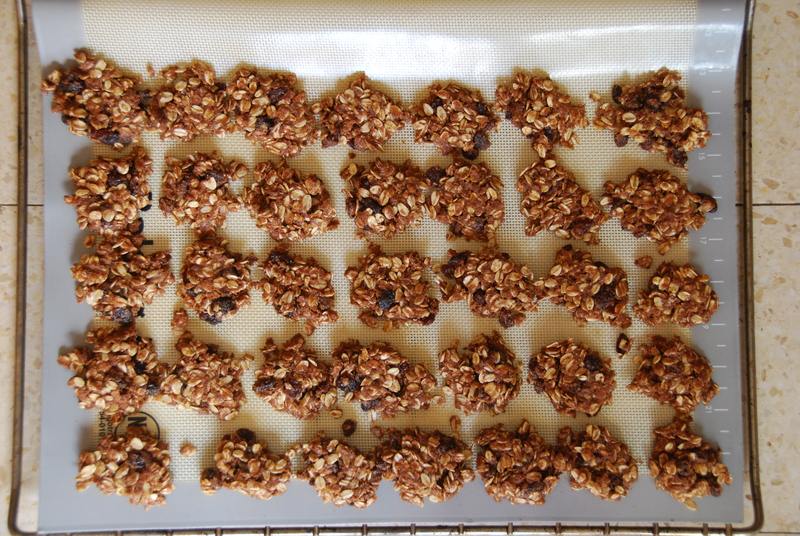 For freezer-cookies, under-bake a little (just until they are no longer wet and then freeze in a sealed container. 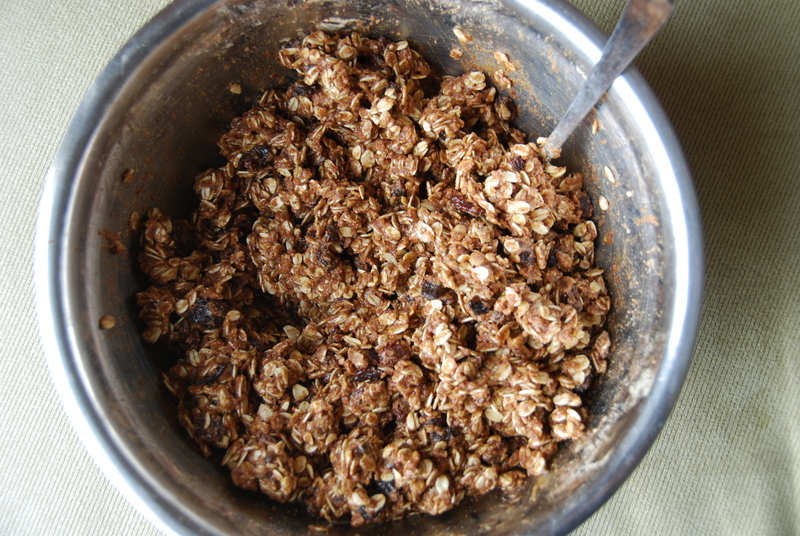 This entry was posted in Desserts & Sweets and tagged cookies, healthy, oatmeal, quick & easy, raisins, summer, vegan, winter by Adi. Bookmark the permalink. I don’t know if this is asking too much, but is there a no-bake option for this? First of all, the batter is amazing on its own (my sis-in-law always stands in the kitchen and eats it as I make it). While I haven’t tried it, I imagine that if you pressed it tightly into a pan [which I advise against in the baked recipe] and froze it, you could cut it into bars and enjoy. It probably won’t be the same [because, well, it’s not the same :) ] but give it a try and let me know! I feel like most people like very soft and/or chewy cookies, but I actually don’t mind crunchy ones! There’s definitely a place in my heart for both types. These look delish!